From face to feet, an all-over-the-body skin conditioner. The natural restorative esters of jojoba, lightly saturated with ozone and combined with the uplifting qualities of grapefruit serve to nourish the skin like no other. 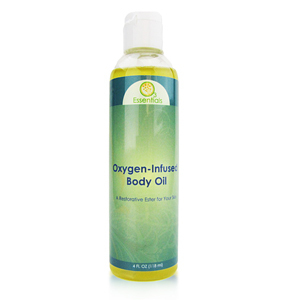 Ingredients: USDA Certified Organic Jojoba with ozone-oxygen. Suggested Use: A full body skin conditioner, applied daily. O3 Essentials body oil may be used after a shower, under makeup, to soften dry areas of skin throughout the day, condition hair or for a great massage. A little goes a long way. Some gelling may occur in cooler temperatures. Shake or warm bottle as needed. Storing: O3 Essentials Jojoba has a stable shelf life. As an ester, it does not go rancid.